A second video post of a hunt a week ago with Tahoe flying down to the lure at the end of the hunt. This is good response to the lure, as you hear a brief whistle, and then you see Tahoe come down out of the tree and land on my gauntlet. During the hunting season I usually go out 2 times a week for hunting. I would love to have some more video of Tahoe on a hunt, especially the part where she makes a catch. If you are interested in helping film content for The Austringer Blog, please leave a comment or contact me! Thanks! *Video credits to the videographer, D2. I was out hunting the other afternoon with a group of friends and we were able to catch some video of Tahoe feeding on the lure at the end of the hunt. Our conversation turned to a “what-if” scenario when trained hawks don’t come down when they are called. It was a good day’s hunt, going out in a nearby woodlot searching for the bunnies. Tahoe took one good swipe at a squirrel during the afternoon, but was pestered by mobbing crows and an angry resident red-tail. With the weather getting warmer, it’s been difficult gauging weight and performance lately. More stories to come as the hunting season comes to an end. Video credit and my Thanks goes to my good friend, D2. Three weeks after Tahoe’s capture, we are working through training lessons to mold and shape her into a high quality game hawk. Just getting to a training state of mind has been a challenge for my first raptor. Her capture weight was 1147g and that was on the high side, considering she was trapped with a super fat keel and a full crop. Taking off the extra weight to bring her full attention to training has been a trying task. This week we are down to 875g and she seems to be getting better at her response times. Continued repetition and positive reinforcement will hopefully provide a positive training experience for her to be able to fly free in the field. 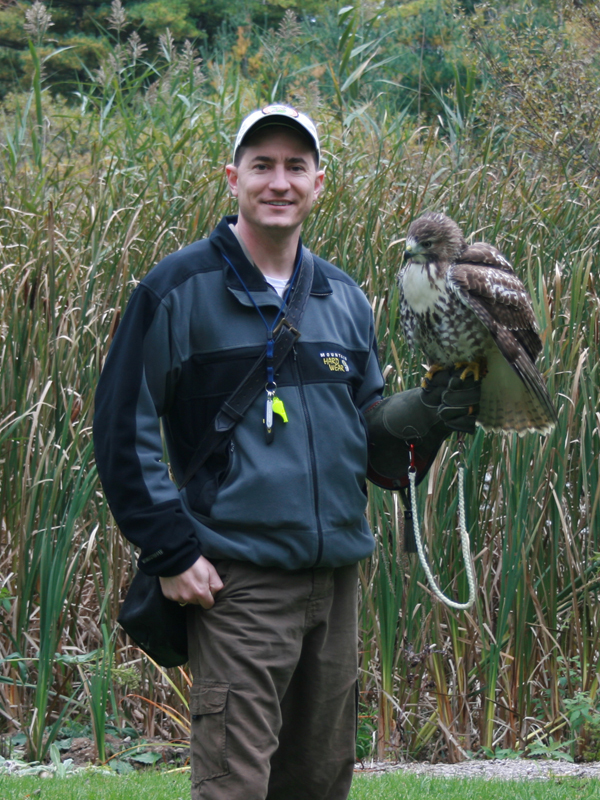 An essential for training birds to come back to the falconer is the hawk lure. For Red-Tail hawks, the lure can be just about anything with a good meal strapped to it. As long as the hawk recognizes that a reward is coming up soon, the lure type is not very important. What is important, is how you construct it for maximum use. Shown below are two examples that I made recently. The one left is a wing-type lure commonly used by falconers for falcons. The wings provide a realistic look to the falcon from far away. 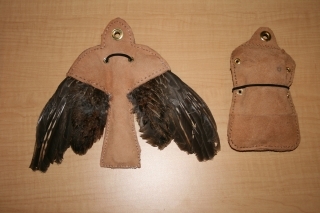 I used a pair of grouse wings from hunting season and sewed some leather together. See the other post on how-to make a hawk lure for complete details. The lure on the right is a pouch style lure that was a first-attempt at a home-made lure with a basic pouch pattern I designed. 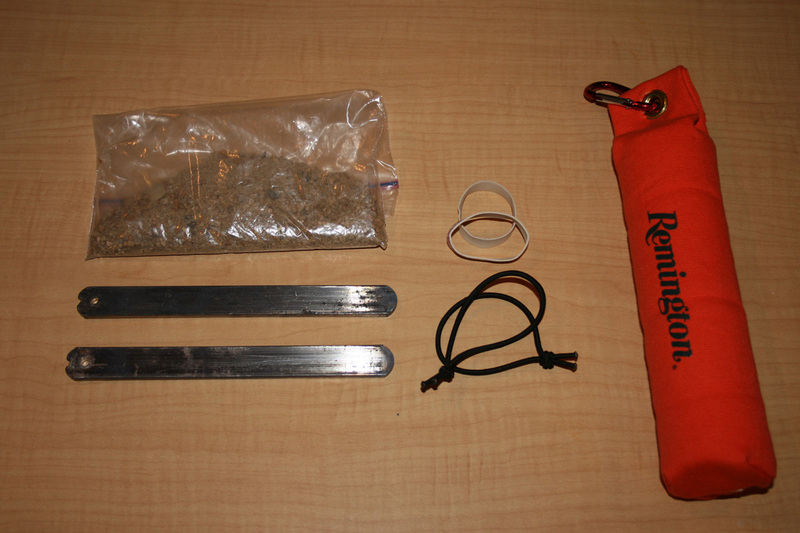 I incorporated a pouch on both sides to hold the food-reward, and an elastic band to hold it in place when swinging through the air. After continued use with bloody meat rewards and other tasty morsels, this design would not fare well in the washer. So, after a few discussions with some other falconers, I arrived at a much more simpler style: the dog retriever toy. 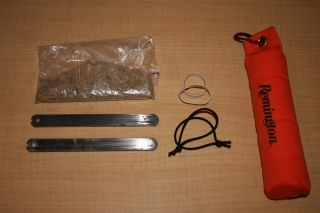 The Dog retriever toy is a much simpler type of hawk lure, yet it is maximized for field use. The Remington style retriever dummies were $15.00 for a pack of three. Each is a canvas covered foam tube, filled with sand. While the sand provides a good weight, and doesn’t shift in the center of the tube, I didn’t find it heavy enough to prevent carrying (just in case). So, I emptied the sand out of the center of the tube, filled it with three lead ingots (for making split-shots) and poured some sand back in to fill up the extra space. This made sure that the lead weights wouldn’t shift on swinging. The canvas style allows for rubber bands to hold the food-reward onto the lure. You can save up the big-type bands from your broccoli stalks, or get some elastic hair-ties from the local drug store. In order to put the dummy/lure back together, I needed a new grommet to seal the top and affix my swivel-clip to the lure. It’s a good idea to clip the other end of the string to your belt or vest, so you can free up a hand to trade your hawk up to the fist.